The first saraband to be advertised as an entr’acte dance on the London stage was danced, together with a ‘Jig’, by the actress Elizabeth Younger at Drury Lane on 3 May 1714. Her appearance was described as ‘being the first time of her dancing alone on the stage’ – she was just fourteen but already had several years of acting experience. The last advertisement to mention a saraband was for a performance at Covent Garden on 13 February 1742. The dancer was the Italian virtuoso Barbara Campanini, ‘La Barbarina’. Little evidence survives to tell us what these dances were like. Both dancers were trained in French dancing, la belle danse. Miss Younger was really an actress who danced, although the surviving choreography for the Türkish Dance duet by Anthony L’Abbé shows that her technique was quite considerable. Perhaps her solo saraband was comparable to Feuillet’s Sarabande de Polixène. Although she was only twenty-one, La Barbarina was a first-rate ballerina fresh from success at the Paris Opéra where her technique had dazzled audiences. I wonder whether her saraband was more like those created by Feuillet and Pecour for male soloists? The first saraband duet was advertised for a performance at Lincoln’s Inn Fields Theatre on 5 May 1724. The dancers were Dupré and Mrs Wall. He was then one of the leading male dancers in the company, while Mrs Wall seems to have been a promising newcomer (she disappeared from the bills within just a few years). She danced another saraband later the same season with Leach Glover, also a leading dancer at Lincoln’s Inn Fields. Both Dupré and Glover were accomplished exponents of la belle danse. Glover went on to perform sarabands with Mrs Laguerre and then Miss La Tour, both leading dancers in John Rich’s company, into the early 1730s. A clue to the nature of all these duets may lie in the Saraband’ of Issee, created by Anthony L’Abbé in the mid-1710s for Dupré and Mrs Bullock and published in his A New Collection of Dances around 1725. The duet is one of three choreographies to the same piece of music, taken from Destouches 1697 opera Issé. The other two dances are both by Pecour. L’Abbé’s dance is technically the most demanding of them. 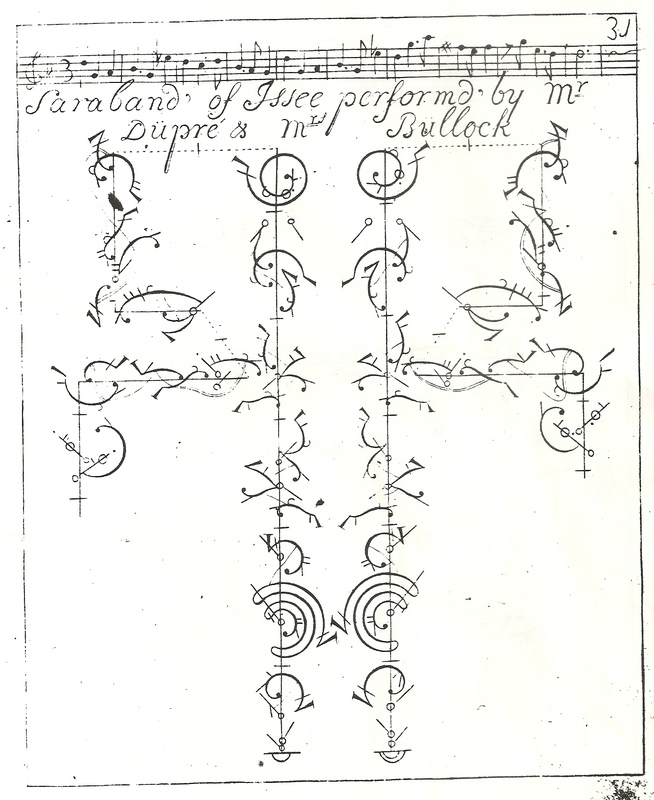 Mrs Bullock, as well as Dupré, was expected to perform beaten steps, turns and ornamentations normal for male technique (although she did not do the entrechats-six notated for Dupré, substituting plain changements instead). The Saraband’ of Issee was a showpiece, which later dancers advertised in sarabands may or may not have been able to emulate. There is also a quite different saraband danced on the London stage and published in notation. 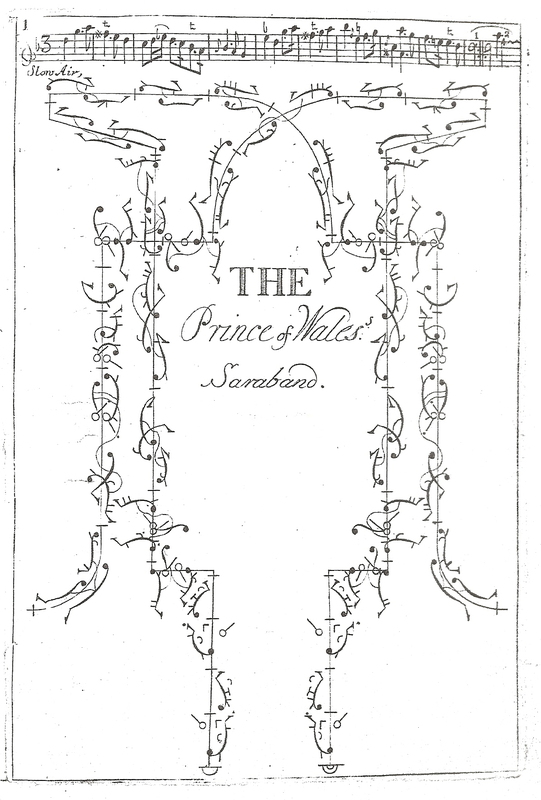 L’Abbé’s The Prince of Wales’s Saraband was created for the birthday of Queen Caroline and performed at Drury Lane on 22 March 1731 by William Essex and Hester Booth. This ballroom duet has no spectacular steps. It makes its effects through subtle ornamentation, including modulations to the timing of individual pas composés although, like the stage choreographies, it recalls the contrast between fast and slow, dynamic and languid described by Pomey in 1671. Such an unadorned choreography requires true elegance and the utmost refinement of technique from its dancers. Hester Booth (née Santlow) was famous for her ‘address’ (which may loosely be translated as comportment). Her partner William Essex (son of the dancing master John Essex who had translated Rameau’s Le Maître a danser) must have been her equal. Was the notated choreography what they actually danced at Drury Lane? Evidence from other notated dances suggests that they may well have included some difficult unrecorded ornamentations. Did the saraband really disappear from the London stage after 1742? Anthony L’Abbé. Saraband’ of Issee [c1725], first plate. Anthony L’Abbé. The Prince of Wales’s Saraband , first plate. This entry was posted in Ballroom Dancing, Stage Dancing and tagged Anthony L’Abbé, Baroque Dance, Hester Santlow, Saraband on November 13, 2015 by moiragoff.